The week before Christmas tends to be pretty quiet for tech announcements, but this year we saw two little announcements that are part of something pretty big. First, there was the UbiSlate 7Ci, an Android tablet that will set you back just £30. And second, there was LG's Chromebase, an all-in-one running Chrome OS. The UbiSlate is really interesting. I've owned chargers that cost more than this little tablet, and while it's hardly an iPad Air, it doesn't have to be: at £30 it's miraculous that it does anything at all, let alone function as an Android device. The Chromebase is likely to be cheap too, because you don't need an awful lot of grunt to run Chrome OS. As our review of the HP Chromebook 11 points out, it's possible to make a genuinely lovely Chrome OS notebook that sells for just £229. Things are only going to get cheaper, and better. The implications are enormous. Let's think about tablets again. In 2010, the cost of the cheapest decent tablet - the original iPad - was £429. Now it's almost down to a quarter of that price: while Tesco's Hudl might not wow you, it's a perfectly good device with a price tag of £119. What we're seeing isn't corner cutting but tech getting better and more affordable. That £30 tablet might not be much cop, but next year's one will be. Steven Sinofsky, former Microsoft Windows president, reckons this is part of a wider trend. The ongoing march of Moore's Law will see device costs "continue to drop precipitously in price to what seems today like ridiculous levels, such as ones we've seen at discount super stores this holiday shopping season in the US. If automobiles are any indication, we should not assume low price is equivalent to low quality for the long term." A £6,000 Dacia might not be as nice as a £30,000 BMW, but it's not going to explode, twang you into a tree or fall apart like a clown car either. What we're seeing in tablets and laptops and all-in-ones is coming to more modest devices too. 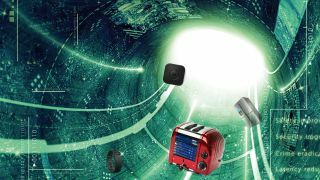 Sensors, processors, networking… it's all getting smaller, smarter and cheaper, paving the way for the internet of things. Taken individually, our devices are getting less powerful. A Chromebook isn't anywhere near as powerful as an Ultrabook, and an iPad isn't a patch on an iMac. But the overall power is still there; it's just being dispersed more widely across more kinds of devices. Individual devices may be getting simpler, but collectively they're more powerful and useful than ever before.